Hi, I am your go-to guy if you want to get things done in Vietnam. I prepare you to meet factories and introduce you to them. May I share what I know about Vietnam free trade agreements with you? 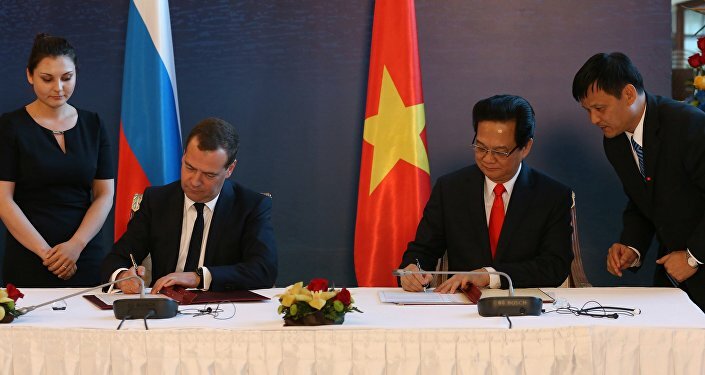 In 2017 Russian and Vietnam signed a free trade agreement. The EU Vietnam free trade agreement is being ratified and is supposed to go into effect in 2018. Vietnam is part of the CPTPP which is the TPP without the USA. How does this affect you? That depends on what country you are importing to and what HS Code you garment qualifies for. It is very difficult to get accurate information about how you can benefit from a free trade agreement. You either have to be a lawyer or customs broker. While the HS codes are universal the exact tax break you get depends on way the free trade agreement is negotiated for your country. It's not as easy as saying, now we can import duty free from Vietnam into Canada. Let's schedule an appointment to chat and discuss free trade pacts between Vietnam and your country. Are you trying to find out the duty you will have to pay for your garment? Are you trying to confirm if a free trade agreement has gone into effect? Either way I can assist you. I am not an expert but I do have a basic knowledge about Vietnam free trade agreements and can introduce you to experts. My role is: I follow free trade agreements and give you some general insight. Most important I know who are the experts and which factories have already shipped goods that qualified for tax breaks. Jumping on the bandwagon is the easiest way to get benefits from Vietnam free trade agreements. Keep reading to learn more about the various Vietnam free trade agreements. The three trade agreements that I follow closely are the ones with Russia, Europe and TPP member countries. 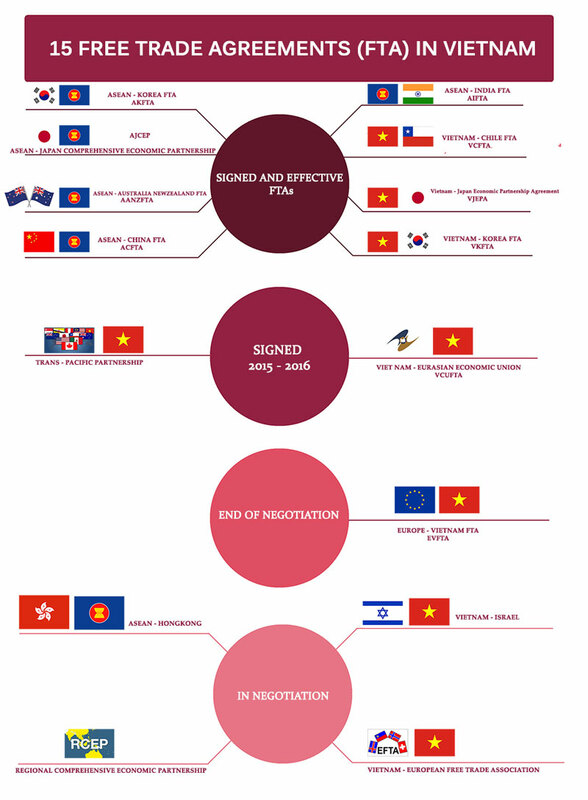 As you can see in the infographic there are many others Vietnam free trade agreements. Getting detailed information about each one is difficult. You have to be a lawyer with lots of time to read to know what the exact benefits are. Start reading. There will be links to the actual documents but knowing if those documents are the latest revisions is not guaranteed. I am willing to help you figure things out and verify details if you are willing to pay me for my time. 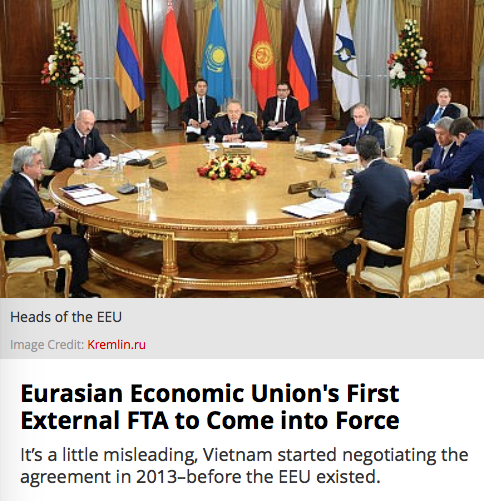 Did you know that the Russia – Vietnam free trade agreement (EAEU FTA) went into effect October 5th, 2016. Our sewing factory has produced garments for many Russian brands during the last 15 years, such as FinnFlare, Baon, Sportmaster, Profmax... We are very familiar with shipping garments to Russia and qualifying for free trade tax advantages. At the end of December 2016, shipments for two of our customers successfully qualified for tax reductions and passed goods through customs at Ust Luga. To determine if you qualify for tax reductions you must first know your HS Code. HS Code 6109 is one example. Ask us and we can help you. The majority of what we produce and ship to Russia has 0% import duty and does not trigger the safeguard. Contact us for more information. Russian Trade Mission in Vietnam. Russia’s main exports to Vietnam include nuclear reactors, mineral fuels, oil and its distillation products and fertilizers. Imports from Vietnam include electrical machinery, boilers and knitwear.In terms of the agreement, Russian automotive companies GAZ, Kamaz and Sollers will be able to create joint ventures to produce buses, trucks, special vehicles, and passenger cars. The localization of production is expected to reach 40 to 50 percent over the next decade. 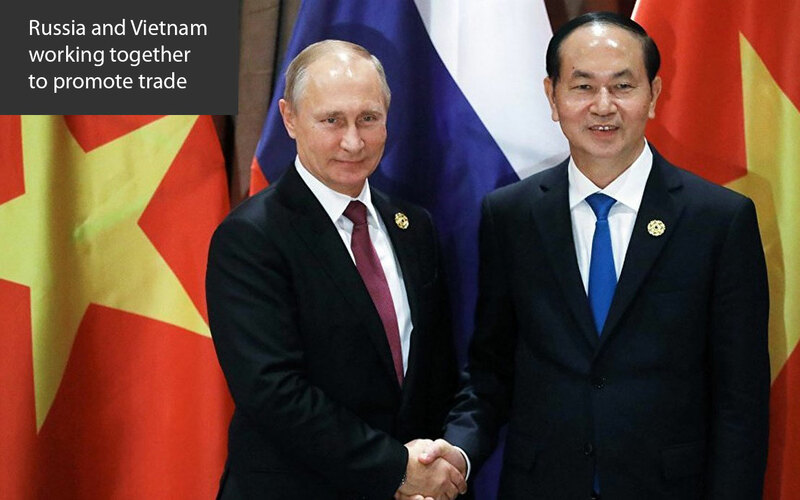 A free trade agreement between the Russian-led Eurasian Economic Union (EEU) and Vietnam takes effect on Wednesday with its ratification. The deal opens the EEU's market of 181 million people to Vietnam. Are you just getting started in Vietnam? If you work for an established company then I can introduce you to fabric suppliers, sewing factories, trim wholesalers and quality control companies. If you need introductions to Visa providers, lawyers, relocators, chambers of commerce, logistic companies then let me know and I will introduce you. As my network in Vietnam expands, so does yours. If you are a start-up fashion brand who is investigating Vietnamese production for the first time then read my guide books. I have written guide books for start-ups to prepare them to meet factories and get price quotes.